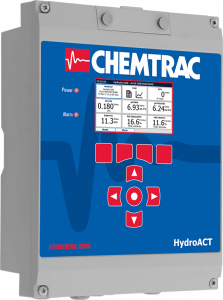 The HydroACT Reagentless Chlorine Analyzer takes online disinfection monitoring to a new level of reliability by offering industry-leading performance, an excellent track record of EPA Method 334.0 compliance, reduced pH dependency, and no requirement for zero calibration. Chemtrac’s line of membrane covered Free and Total Chlorine sensors have no moving parts, no bottles of reagent to change out monthly, and quarterly maintenance takes less than five minutes to perform. The HydroACT Chlorine Analyzer standard configuration includes version HA2 analyzer, 1 sensor (Free or Total Chlorine), 1 analog output, and 1 year consumables. Other configurations available.